In this re-telling of The Twelve Dancing Princesses, 13 year-old Reveka is an apprentice herbalist in a medieval castle in Romania. She's striving to find some kind of herbal cure to the curse that seems to make the twelve princesses shoes fall apart, and causes them to be sleepy all day. Frighteningly, anyone who tries to observe the princesses at night is stricken by a coma. Whoever breaks the curse will be rewarded with either one of princess's hands in marriage, or a great sum of money. Reveka is hoping to come up with the cash to continue her studies as a master herbalist. This is a richly imagined world full of little details that truly bring everything to life. I liked Reveka's sense of humor and pragmatic sensibility. After much research, she comes up with the makings of an invisibility cap, and discovers the dancing princesses underneath the castle. This portion reminded me of Beauty and the Beast as the princesses have been held captive by a zmeu - a shape-changing dragon who is trying to convince one of them to give up her mortal life to marry him and remain in the Underworld. Here, the story takes a definite turn towards the Persephone legend, as Reveka bargains for the princesses freedom in exchange for her own. While she agrees to marry the zmeu - and she's startled to learn that she even had a little crush on him in his human form of Prince Frumos, she's disgusted by his demonic form, that of Lord Dragos. Her father, and her loyal sheepherder friend Mihas attempt to rescue her from the underground kingdom with limited success. She holds out on eating or drinking anything, knowing that will bind her permanently to the land. In the meantime, Reveka decides to investigate the failing flora in her new kingdom, something which holds the key to zmeu's waning power. The pressing magical darkness is another hurdle Reveka has to overcome as she struggles to hold on to her former life aboveground. 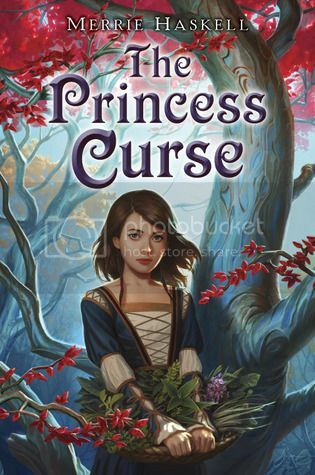 Her decision to finally give in and eat the pomegranate seeds is tempered by her clever ability to bargain a compromise with Dragos for visiting time in the world above where the princesses are happily married off to foreign princes, and even Reveka's father finds happiness with a new wife. Despite their marriage and some stirrings of feelings between Reveka and Dragos, as well as the unrequited feelings that Mihas seems to have for Reveka, on the whole, this does not read like your typical love-triangle YA novel. Reveka's marriage feels more like something out of a fairy-tale and very much in line with the middle-grade audience for this book. is there gonna be a sequel? i want one!